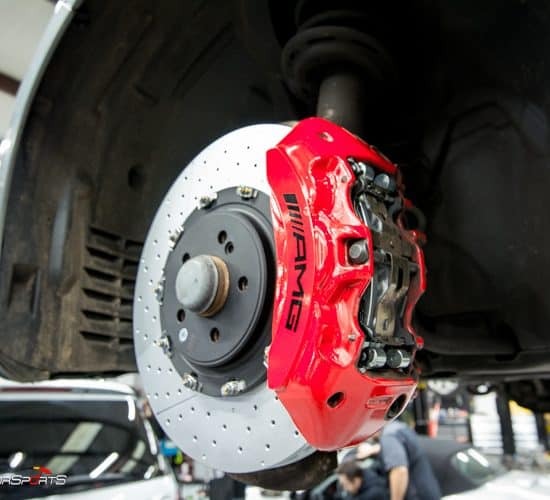 #SchooledbySolo- Stop on a Dime with Big Brake Kits. 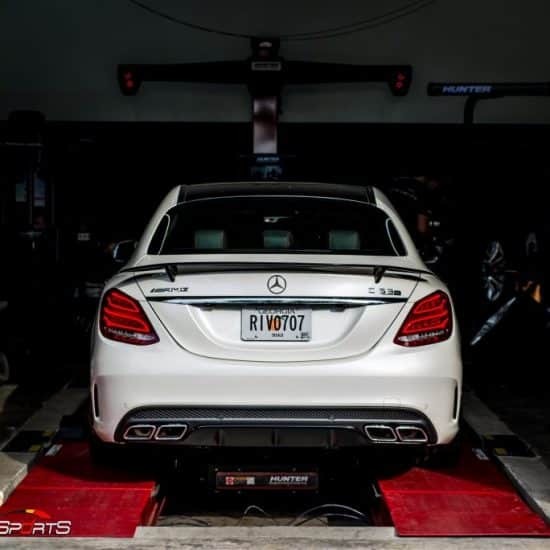 Solo Motorsports / Mercedes Service / #SchooledbySolo- Stopping on a Dime with Big Brakes. 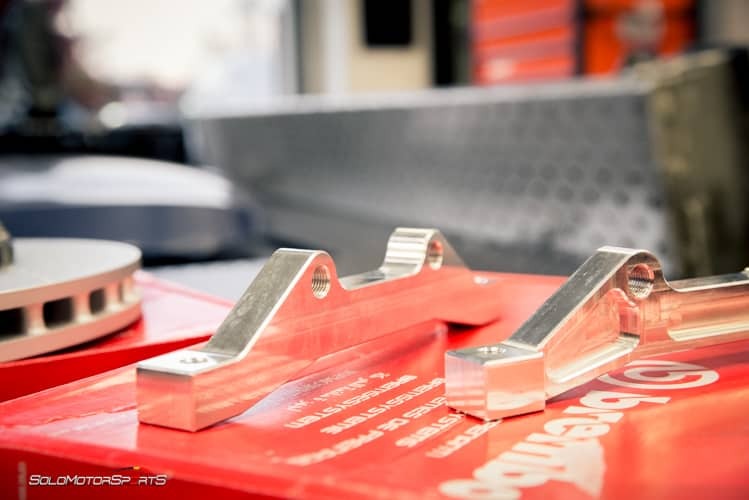 When you have a performance car, a daily driver or a weekend midnight race sleeper, your stock brake system might just don’t always cut it. 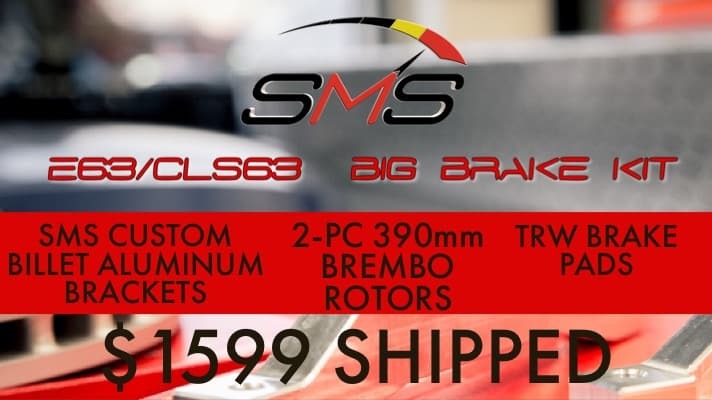 If you’re driving aggressively (and, let’s be honest, why wouldn’t you be, we know you’re flying down 85 goin 110, we aint snitchin’), you need something that will handle the serious power and speed your car (and foot) produces. 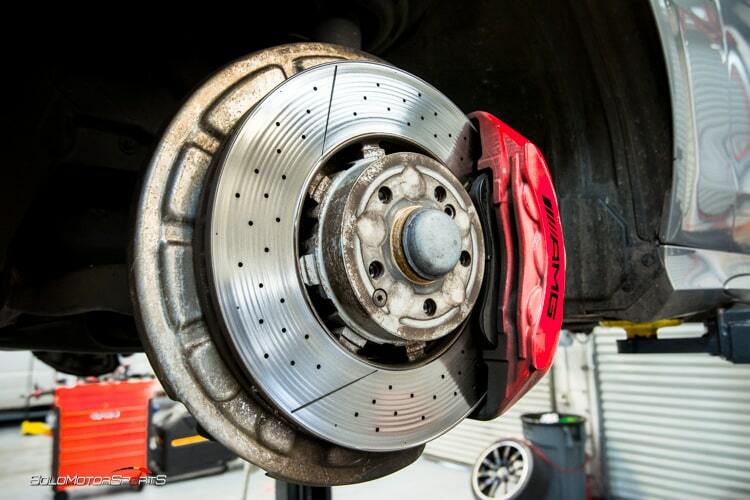 Performance brake upgrades like a new set of pads – or even a big brake kit – will fit that bill. Think. Step on the brakes. Is the ABS system kicking on because the wheels are locking up? Congratulations, your car simply can’t stop any faster. 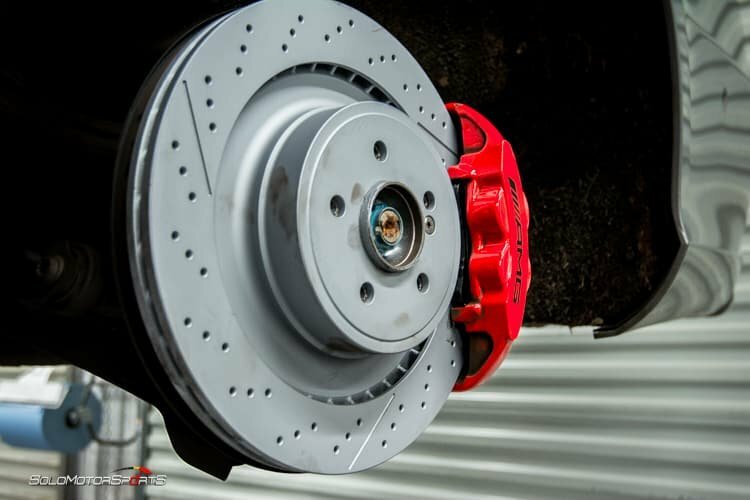 Big brakes and drilled rotors WILL help with heat dissipation, and you don’t just need to worry about that on the race track, this applies to daily driving habits swell. And if you’re actually tracking your car enough to warrant different brakes, then you know enough to ignore this advice. 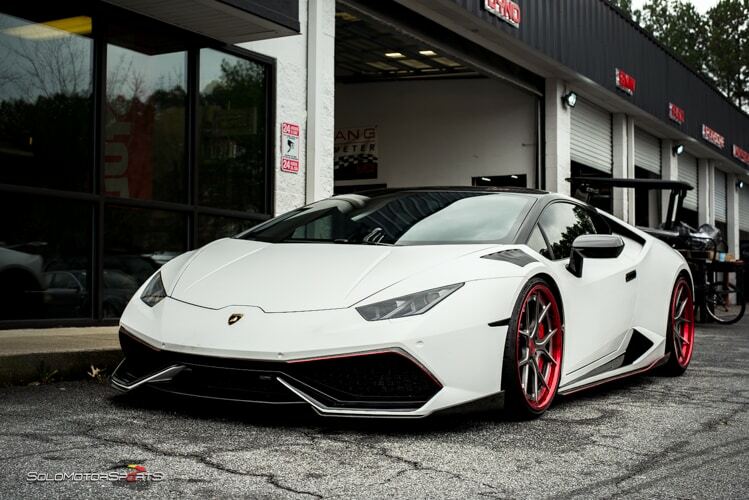 Recently we had the pleasure of installing a kit that saved our customer a substantial amount of Benjamins! 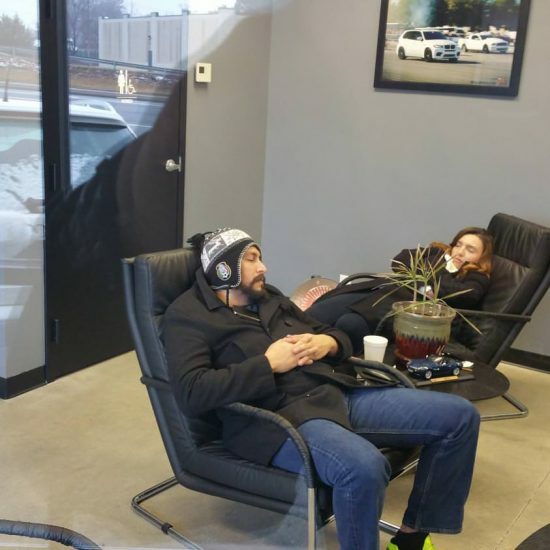 Hearing that come out of one of our client’s mouth absolutely floored us. That price is absolutely asinine and ridiculous. 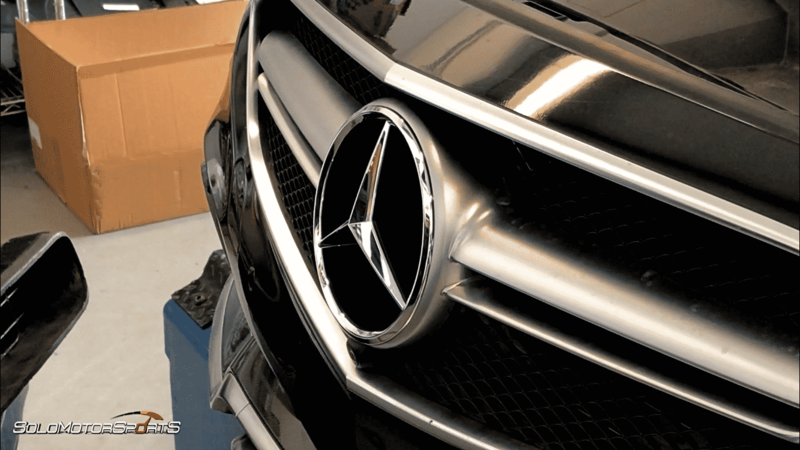 Mercedes must be out of their mind demanding a price for just replacing the stock front brakes. We had to seek a quick and reasonable solution to this dilemma. This dude needed new front brakes FAST.Insisted on OEM parts ONLY. The Team sat there spitballing ideas back & fourth. Then there was an epiphany. Light went off and BOOM. 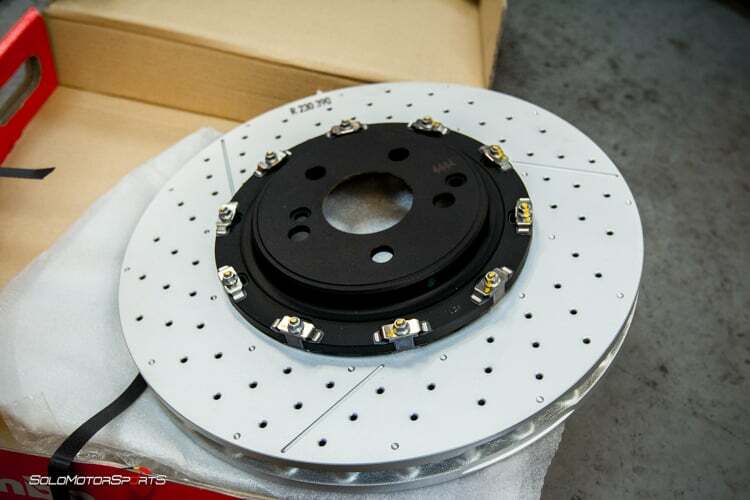 Why not a Big Brake Kit? 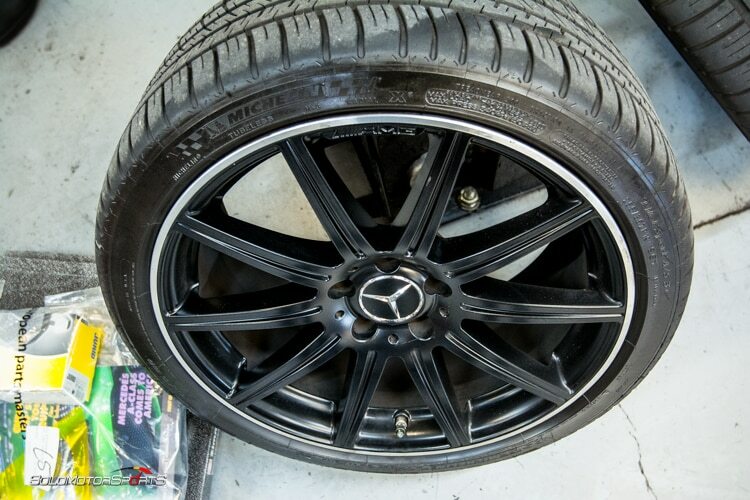 There was a new Big Brake Kit in the back- consisting out of genuine OEM 2 piece 390mm Rotors that could fit this Merc . Eureka! Genius. Good Job. 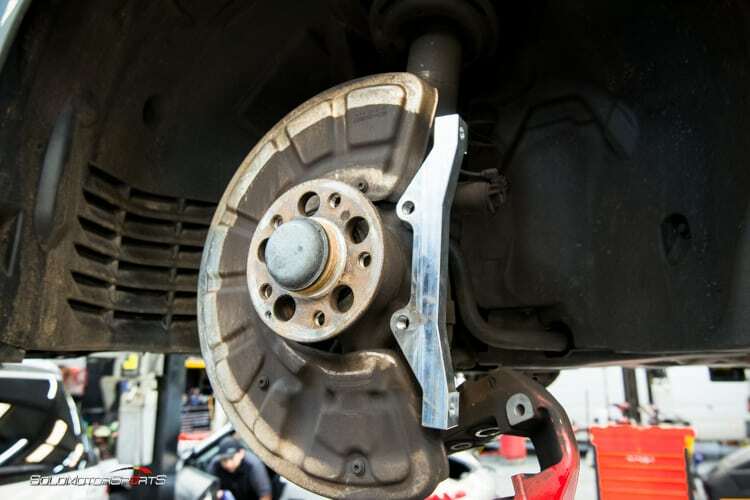 To make these rotors fit the boys at Solo had to custom make some nifty new brackets. Forged from high strength Billet 6061 aluminum, featured below. 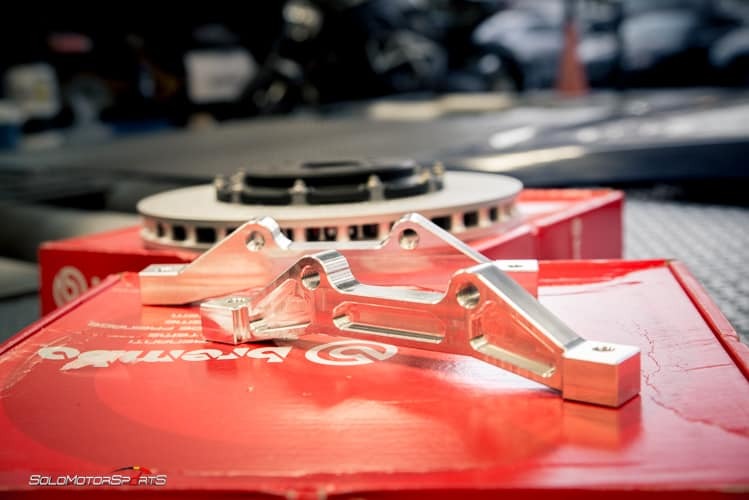 Custom Bracket, doin’ its thing; the bracket pushes the caliper out to accommodate the thicker rotors. 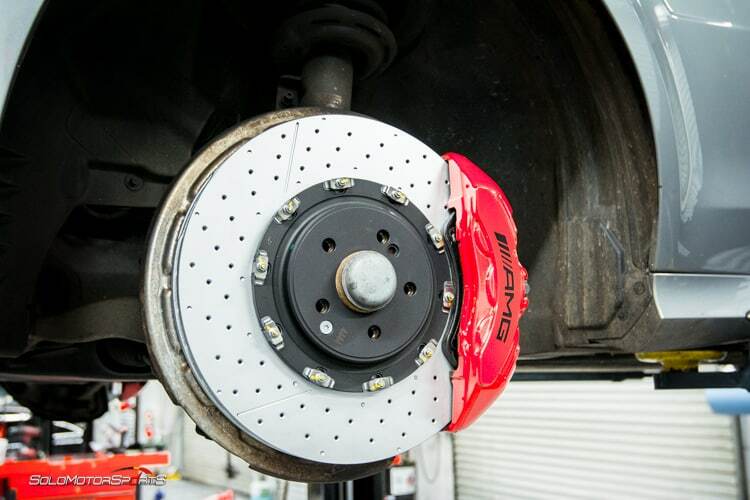 Most cars from factory are designed to be Front Skid Limited, that is, the front brakes will lock up before the rears. The reason being if you lock the front brakes, the car will continue to go in whatever direction the wheel is pointing(dun). This allows for much safer driving compared to the alternative, which is called Rear Skid Limited. 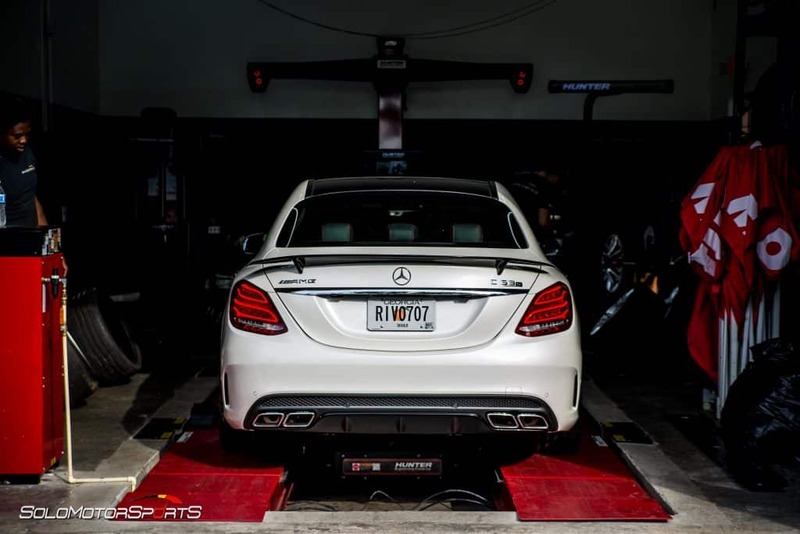 When a car is Rear Skid Limited, it means the rears will lock up before the fronts. When this happens, the car will try to spin out. 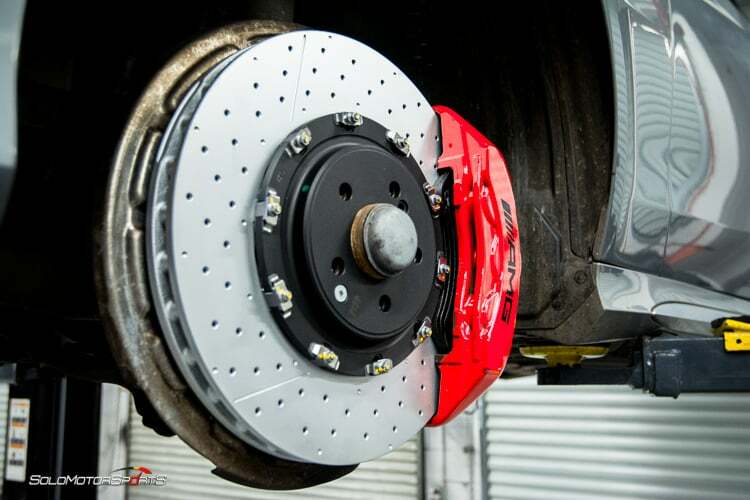 Since during braking the weight transfers to the front of the car, there is less weight in the rear which causes it to try to rotate around. 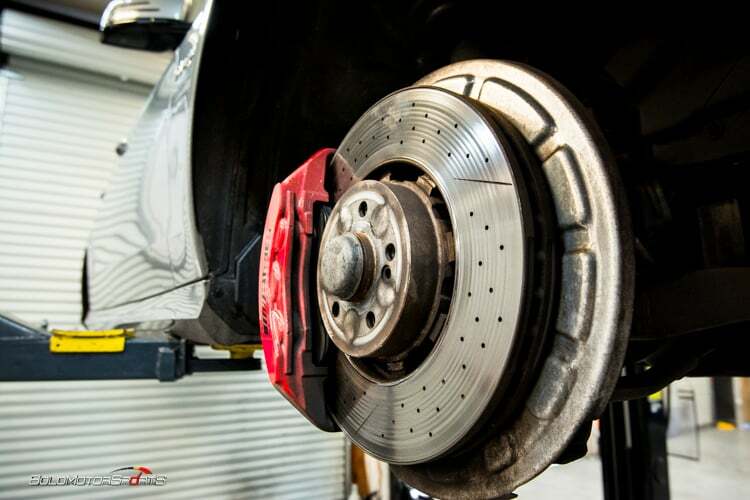 In some cases, you can spin around completely, which is why your front brakes have more braking force than the rear. For the TL:DR crowd: More braking surface also gives more control, more rotational mass (Newton’s second law) means safer breaking distances. 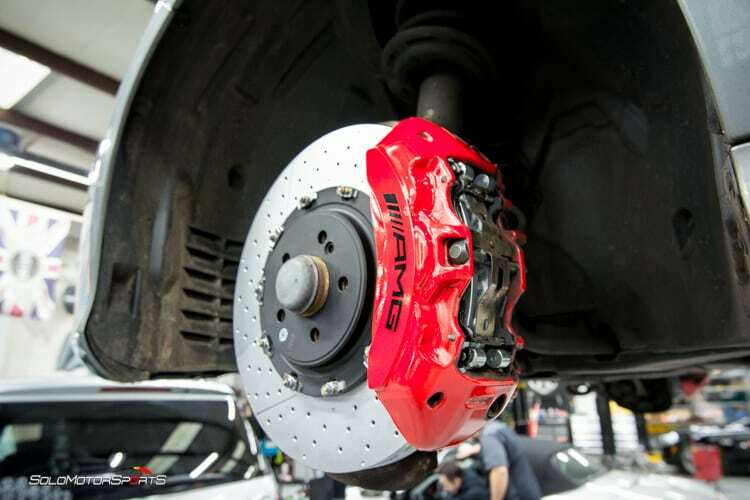 We have just TWO sets of these particular brakes left for sale out of the 40 we originally ordered. Don’t have a Benz? Don’t worry! Give us a call and we can discuss how we can fabricate a set just for you in the time window you need it!